Mornings should be everything but boring. You should start your mornings off the right why by having something that is healthy yet satisfying. Ultimately you need a breakfast of champions that will help you stay going all day long. That is exactly what I did this morning with my Blueberry coconut milk smoothie and I am still going. Most mornings I normally will blend us up a smoothie with whatever fruit I have left over from my meals before . I could have drunk my standard smoothie, sipping away with my straw, but I sometimes feel like I should eat something with it as a straight fruit smoothie isn’t quite enough every morning. I love food textures and I think a smoothie takes the fun out of that, plus I feel that a full sometimes requires a fork or a spoon. (We all know that is not true.) 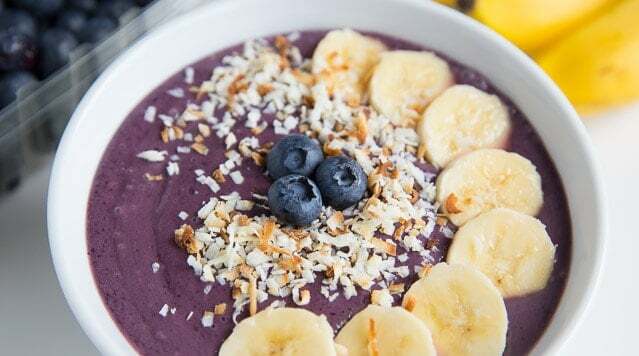 So this morning I decided to try a blueberry Coconut milk Smoothie Bowl instead. I am getting out my spoon instead of using a straw and I am super excited. This was a healthy smoothie bowl, made with blueberries, bananas, yogurt, coconut milk and honey. Topped with some spinach, sliced bananas, and blueberries. I am so glad I did this because I didn’t feel like I needed to grab some toast or another filler food just so I could have the texture I enjoy plus it was differently satisfying. 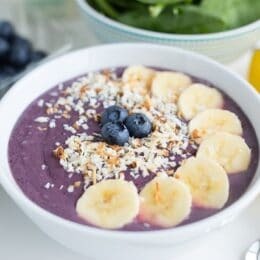 A bonus for this amazing smoothie bowl is that it was filled with lots of nutrients and antioxidants from the blueberries and other ingredients. 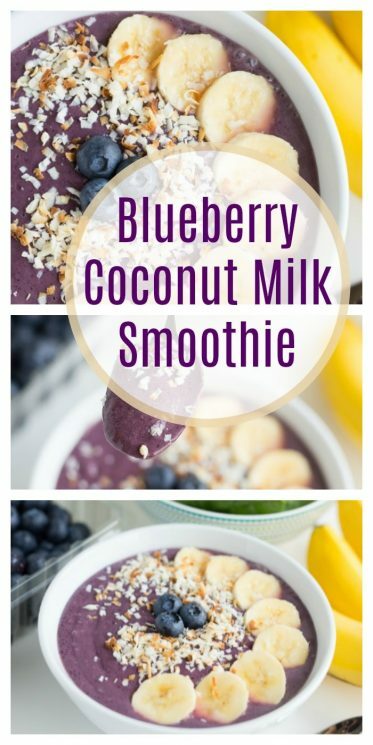 One of my new go to breakfast meals is now this Blueberry Coconut Milk Smoothie because I know it will give me the extra boost to get through my day. If you love smoothies as much as we do, check out our Smoothie Category with lots and lots of smoothie recipes! You might think I’m silly for saying how much I loved this bowl of heaven this morning, but really, what’s not to love about a bowl full of fruit that was blended into a smoothie bowl and topped with goodness. I felt like I was eating dessert for breakfast. 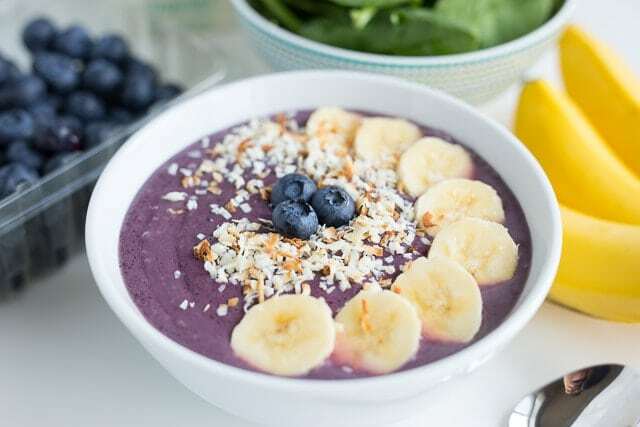 One bite of this blueberry coconut smoothie bowl and you are ready to conquer your day goals. Yes, of course you could always make it plain and just blend your fruit and drink it with a straw, but with a few spare minutes it’s nice to pour it into a bowl, decorate the top to look nice, grab a spoon and enjoy a mouth full of a goodness. 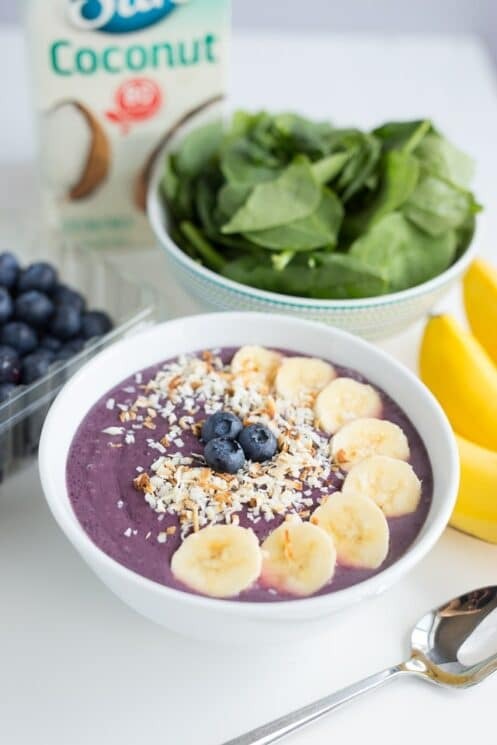 You can have a lot of fun with this and other variations of the Smoothie Bowl. It is a perfect way to use up your left over fruit. Blend it all together then top it off with fun toppings like nuts, seeds, granola or low sugar trail mix that you know your kids will love. I am all about adding toppings just like an ice-cream sundae you can never have too many toppings right? 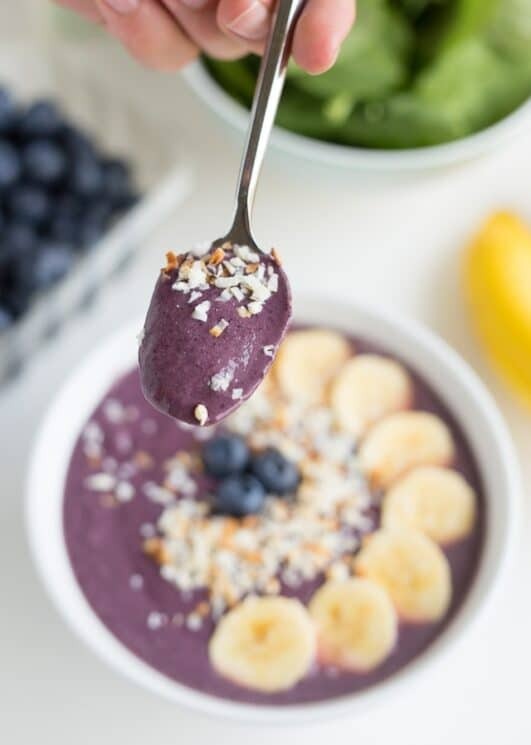 Blended a little thinner and this smoothie bowl is also great as a standard straw sipping variety but I hope you try it as a smoothie bowl with delicious toppings added by the spoonful. 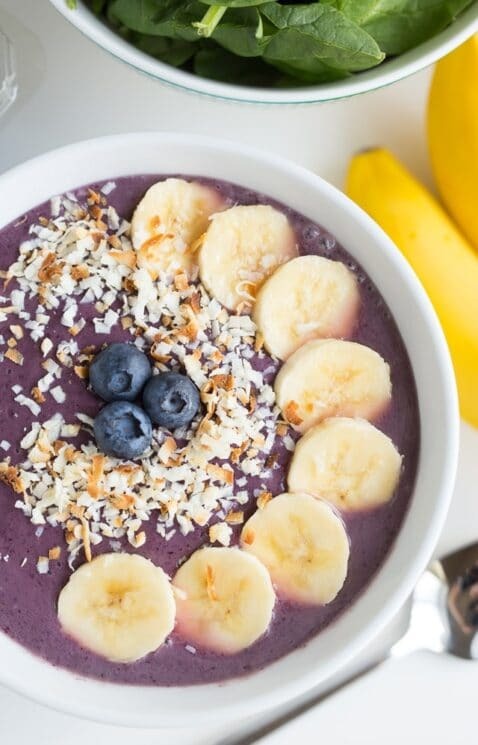 Tell us what you like in your smoothie bowls. I am on Raw diet so planning to skip putting yogurt but would definitely give a try to this recipe as I love coconut milk. When you give your nutrition facts, what would be considered a serving? Thank you! Hi Carol, a serving of this smoothie is roughly equal to one 8-ounce cup– though it could be slightly more than than depending on the size of your fruits.